I find it kind of sad that the first Studio Ghibli film I review as a critic is, purportedly, the last film to be made by the company’s founder, Hayao Miyazaki. While he retired and later resurfaced multiple times in the past, the famous animation director has been clear to state that this retirement is due to his failing eyesight. As such, it’s probably safe to assume that this will likely be the last film we’ll see from the man himself. 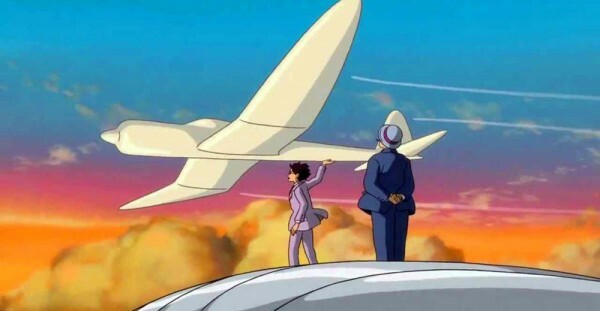 “The Wind Rises” is an animated biopic centered around Jiro Horikoshi, voiced by Joseph Gordon-Levitt, a Japanese aeronautics engineer who was tasked with designing aircraft for the Japanese military in the years leading up to World War II. A few of the voices rounding out the American voice cast, we have people such as Martin Short, Emily Blunt, John Krasinski and Stanley Tucci. This film is definitely on the more artistic side of Studio Ghibli’s repertoire, with a few choices that make it a bit difficult to follow. As such it takes quite a while for the story to really get going. The pacing is a great deal slower than most of the animated films American filmmakers are used to. However, this film also felt slow even by Ghibli standards. The animation is very well produced, but there are a few moments where the simulated camera moves have an artificial feeling to them, making it hard to figure out if it was part of the original film, or if it was one of the editing decisions made by Disney for the U.S. release. Speaking of the editing, one of the things that made the story a little hard to follow was the very quick and harsh edits for some of the sequences. I understand that the story is trying to cover a person’s life, but it does tend to rush a few things here and there, which is weird given how slow it felt overall. What also doesn’t help is the lack of transition between the real world and the dream world, where Jiro frequently converses with his Italian aeronautics idol. Another issue with those sequences is that there’s no real build up – they just happen. However, the film manages to make things easier to follow as it goes on. In regards to the English dub itself, it’s fairly hit or miss throughout. Part of the problem may be attributed to the fact that some scenes have very quick bits of dialogue. Based on what limited knowledge of Japanese I have, there are some phrases that are full sentences in English that may only take up one or two words in Japanese. As such, I think it was equal parts translation difficulties and lip sync difficulties. The voice acting is pretty good with most of the adult characters. The times when there are child characters are probably the weakest part of the dub as a whole. Thankfully, that’s only during the beginning of the film where our main character is a child. Overall, “The Wind Rises” was interesting. While it definitely had some good artistic moments, it’s not without a few problems. With some of the issues it’s hard to tell if that fault lies with the film itself, or how it was handled by Disney for its U.S. release. This is probably one of those films that will only appeal to those who are already fans of Studio Ghibli and Hayao Miyazaki. There’s not really much that’s here for the average mainstream viewer. However, it’s still a well-produced animated film that actually decides to take on some darker subject material, something I haven’t really seen from the company since “Princess Mononoke.” It’s definitely an interesting way for a director to leave his mark before leaving the industry. 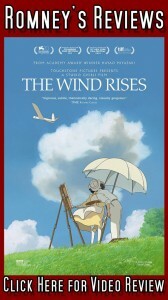 “The Wind Rises” gets a 4/5.